He joined Great Dane in 1937 as the company's first salesman, building relationships with customers throughout the southeastern US. 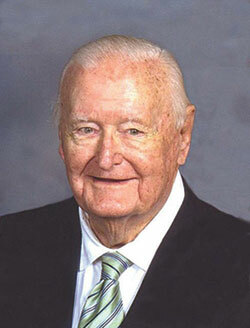 He helped found the Truck Trailer Manufacturers Association and later served as its third president in 1943. In 1949, Hammond also helped develop the industry's first true refrigerated semi-trailer, according to the company. Hammond was responsible for changing the colour of the Great Dane logo's oval from black to red in 1953. He retired as Great Dane's chairman in 1984 but remained on as a consultant. Hammond's son Kit and grandson Chris both have worked for the company. Kit retired in 2005 but Chris remains as vice-president, dealer sales. "Mr. Hammond was a pioneer in the truck trailer industry for more than 50 years, and his influence was instrumental in developing what began as a local trailer company into a national enterprise," Great Dane said in a release. "Such an example and spirit will not soon be forgotten."